Where exactly do FPGAs fit in the ever-electrifying automotive landscape? SAN FRANCISCO — While AI processors and AI-ready SoCs are getting all the attention from the investment community because they are deemed critical to emerging highly automated vehicles, what about FPGAs? Where do they stand in the AI silicon race? In a move to reaffirm its long-standing contributions to the automotive industry and future roles that FPGAs are expected to play inside autonomous vehicles, Xilinx disclosed a collaboration with Daimler AG to develop “ultra-efficient AI solutions” for future Mercedes-Benz models. According to the two companies, Daimler is building an “in-car system” using Xilinx technology for AI processing in automotive applications. Details of the partnership, however, remain sketchy. Asked about the timing for the system launch or exclusivity of the Xilinx-Daimler deal (“Did Xilinx unseat competing chip vendors like Mobileye or Nvidia?”), Willard Tu, senior director for automotive at Xilinx, declined to comment. FPGAs, though, are more popular in automotive than most people realize, according to Phil Magney, founder and principal of VSI Labs. Speaking of the company’s heritage in the automotive market, Tu explained that Xilinx FPGAs originally got into the automotive infotainment system as glue logic before the company later found its sweet spot in the ADAS market. Tu stressed that FPGAs are best suited for handling increasingly complex ADASes and automated driving. In 2014, Xilinx chips were adopted by 14 car makers and designed into 29 models. By 2018, Xilinx chip solutions extended their reach to 29 makes in 111 models, according to the company. 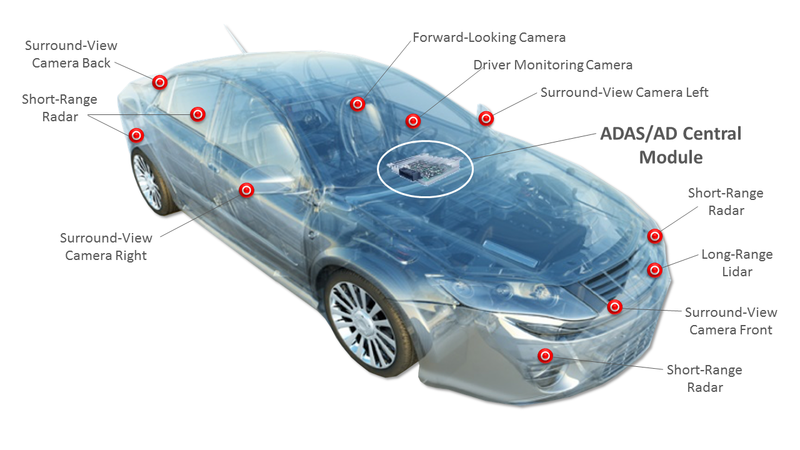 In the ADAS market, Xilinx’s FPGAs have proven to be instrumental in processing complex sensory data coming from a variety of sensors including image sensors, lidars, or radars. First, Xilinx FPGAs would allow differentiations for car OEMs who want to run their own proprietary image processing algorithms. In contrast, Mobileye offers a “one-size-fits-all” solution, said Tu. Second, Xilinx is an “open box” for tier ones, who must deliver and guarantee functional safety compliant with ISO 26262. Mobileye, on the other hand, provides a “black box” — keeping tier ones and OEMs in the dark as to what exactly is going on with Mobileye’s software inside their box. Third, Xilinx’s image processing solution provides flexibility in terms of where in a vehicle it should be installed, said Tu. It can be put in the front camera, on the windshield, or even in the central module. Fourth, “We offer scalability,” said Tu. Combined with Arm subsystems including Cortex-A53 and Cortex-R5, Xilinx-designed ZU2 to ZU5 can add more programmable fabrics as demanded by applications. As new car assessment programs add new requirements every 12 to 16 months, “we can offer more flexibility in our solutions compared to SoCs,” stressed Tu. Fifth, Xilinx is proud of FPGA’s adaptability, which can go a long way with changing requirements for functionalities demanded by the automotive industry. An example of this adaptability can be, perhaps, best described in what Xilinx calls the Dynamic Function eXchange (DFX). Assume that Xilinx’s chip was being used in the Level 3 automated vehicle for monitoring a driver. That same chip can be reprogrammed to do parking for valet parking applications, for example. The programmability would allow the personality of the chip to change, explained Tu. Xilinx’s other claim to fame is the company’s dominance in the lidar market. Xilinx’s chips are not only in several major tier ones’ lidars but also in lidars designed by most startups, according to Tu. Considering so many different technologies are implemented in a variety of lidars and the technology influx will continue, it is understandable that many lidar vendors are turning to Xilinx’s programmable solutions. While the lidar market might remain still minuscule, Xilinx might have a bigger role to play in sensory data processing at the edge in general. While the FPGA is doing well in the ADAS market, Tu believes that FPGA’s fundamental advantage — “low latency and higher throughput” — will truly shine in the highly automated vehicle market. 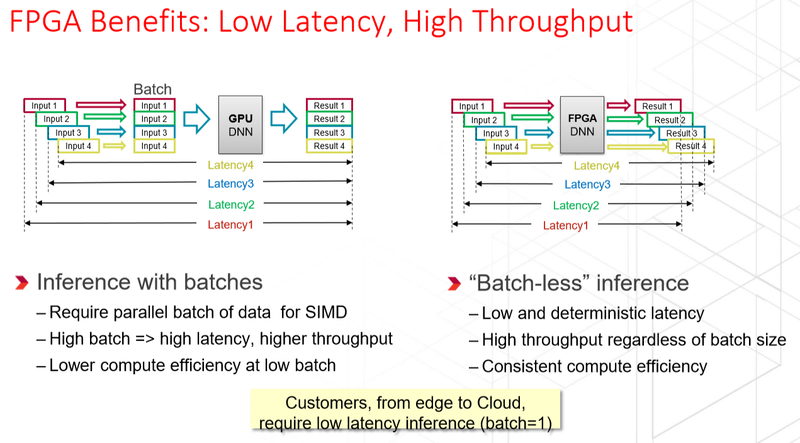 When GPUs carry out deep-learning inferences, they require a parallel batch of massively parallel data to go through single-instruction multiple data (SIMD). In hopes of doing more computing and less fetching, the industry has tried developing wide SIMD architecture. But you can only make register files so wide. While that’s true in principle, the industry observers are reserving their rights to make a judgement as to how Xilinx would ultimately stack up against an Nvidia or a Mobileye in the AV market. However, the company has pulled back the details, at least for now. Tu told us that the tape-out of ACAP will happen this year, but product shipments to customers won't start until 2019. At the end of the day, though, “the challenge versus other solutions is cost and power,” said Demler. While noting that the Daimler deal is “a significant win for Xilinx,” Magney said that it is hard to know when the end application is going to be made available.